This is a traditional recipe good for anything that ails you. It's the absolute best when you've got the flu, and it's great the second and third day. Note, these matzoh balls are 'sinkers'. 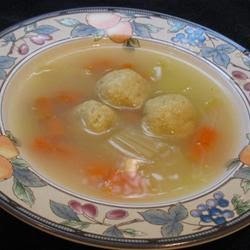 These are traditional matzoh balls, as this recipe was passed down from my great-grandmother who needed to make them as heavy as possible to feed a hungry family during lean times. Cut the matzoh meal by 1/2 cup to lighten the load.